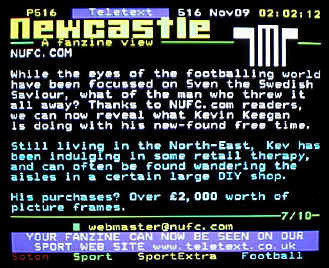 Faced with all those extra pages to fill (as well as the online version), the ITV teletext people decided to devote some space to the spurious rantings of self-appointed toon commentators. Why only to 84? Due to the World Cup, teletext elected not to continue through the close season with their Premiership fanzine pages, then for season 2002-03 changed tack and chose not to invite us back. Their loss.